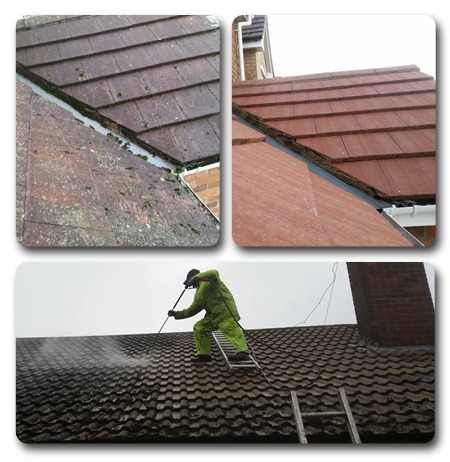 3 Flow offer excellent roof cleaning services in Hull which are carried out by our experienced operatives. Jet washing a roof can transform the appearance of a property massively and improve the overall appearance. A clean roof also carries rain more efficiently to the guttering and reduces the risk of leaks and other possible causes of damage. Having an untidy roof will affect your property in a number of ways. The first consequence of having an untidy roof is the poor appearance to visitors. Having a lot of mould or debris on your roof can make your home or business look uncared for. The clutter on your roof can also blow into the gutters around your property, blocking them and making drains impassable. No roof is too large for 3 Flow to clean. Whether you have a 1 story 900 square foot home or a 4 story 9,000 square foot factory we can clean and restore the roof of your property safely and professionally. Maybe its just your house or maybe it's the whole street with roofs covered in black streaks. Whatever the situation is, let face it, it’s ugly. Most people won’t even notice it happening because it occurs gradually and at the same rate as all of the homes around yours. In many situations, what looks like an old roof nearing the end of its life is in fact just a middle aged roof covered in mold, algae, and debris that is covering over a perfectly functional roof that doesn't need replacing. Before you payout thousands of pounds on a new roof, why not let 3 Flow offer you a free assessment and estimate. In North Yorkshire we have an extremely varied climate system that can mean months of humidity are followed by long periods of damp cold weather. Because of this and various other factors unique to our climate mold, algae, and mildew are able to thrive and grow on our roofs. The black streaks you can see up on our roofs are essentially living plants! These typically start off in just a tiny area of the roof and then eventually spread into ugly dark streaks, and eventually take over the whole roof. Quite often in extreme cases you can’t even tell the original colour that the roof was before these plants had taken over. When cleaning a roof it is essential that extremely low pressure is applied whilst cleaning. Using high pressure will cause irreversible long term damage to the roof. 3 Flow understands the importance of your roof and the correct cleaning procedures required for properly maintaining its stability. Save yourself hundreds even thousands of pounds on replacing a roof that only needs a low pressure wash. Call 3 Flow today on 07880798531 / 01482 802323 for a free quote and see how we can help you with your roof cleaning problems.